James Bond's (Daniel Craig) first "007" mission leads him to Le Chiffre (Mads Mikkelsen), banker to the world's terrorists. In order to stop him, and bring down the terrorist network, Bond must beat Le Chiffre in a poker game at the Casino Royale. Bond meets a beautiful British Treasury official, Vesper Lynd (Eva Green), who is assigned to deliver his stake for the game and watch over the government's money. But, as Bond and Vesper survive a series of lethal attacks by Le Chiffre and his henchmen, a mutual attraction develops. $40.833 million on 3434 screens. By my reckoning, 2006’s Casino Royale stands as the second time the series’ producers really tried to “relaunch” the franchise. 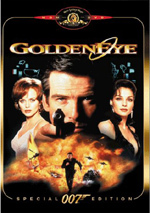 One can argue with my claim for the first relaunch: 1995’s GoldenEye. It was notable because it featured a new Bond in the form of Pierce Brosnan, but it didn’t differ from prior flicks to a huge degree. It came across as a relaunch mainly because it’d been six years since the last Bond flick, and it felt like a minor attempt to invigorate the series with some new talent. On the other hand, Royale clearly acts as an attempt to change Bond and make him more relevant for the new millennium. Not only did the producers go four years between flicks – the second-longest gap after the span between Licence to Kill and GoldenEye - and cast a new Bond in the person of Daniel Craig, but also it took the franchise back to its beginnings via its story. In Royale, we find a younger, less experienced Bond (Craig). At the film’s start, we see him earn his 00 status, and then the flick takes us to Uganda. We meet Le Chiffre (Mads Mikkelsen), a baddie who runs investments for various shady sorts. In the meaintime, we see Bond on a mission to capture a bomb-maker connected to Le Chiffre. His harsh approach results in serious problems, especially since he ends up on the grounds of an embassy – and caught on camera. This embarrasses the British government and lands Bond in hot water with his boss “M” (Judi Dench). Though she orders him to lay low for a while, he heads to the Caribbean to follow a lead he obtained when he took the bomb-maker’s cell phone. This eventually leads up the rope to Le Chiffre, who loses a lot of dough when he gambles his clients’ money. With the need to raise cash to make up for this shortfall, Le Chiffre stages a very high stakes poker game in Casino Royale. “M” sends Bond to ensnare Le Chiffre in the contest, and financial specialist Vesper Lynd (Eva Green) goes along to watch the cash. The rest of the movie follows various forms of intrigue, action and romance. Occasionally the folks behind Bond trumpet a “back to basics”, grittier approach to the series. This happened twice in the Roger Moore days with Live and Let Die and For Your Eyes Only as well as in the brief Timothy Dalton era of the late Eighties. Royale goes down this path again, though with the most satisfying results. 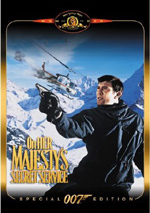 Mind you, I dig the two Dalton flicks, but Royale reignites the series in a very compelling manner. Much of the credit goes to Craig’s steely performance as Bond. Many criticized his casting but he proves the naysayers wrong via his strong take on the part. Craig has to give us a different kind of Bond, since he’s a work in progress. We watch his personality evolve through the film, while the other actors played Bond as an already concrete character. Craig pulls off these challenges without self-consciousness. He doesn’t wink back at prior Bonds or overplay the character’s development. Instead, he makes the transformation natural and effective. We watch Craig pull the character together on screen and present a dynamic, compelling personality. And a darker one. Much has been made of Royale’s choice to provide a grimmer tale, and I feared this decision might backfire. It was possible the filmmakers would go so far in that direction that the result would no longer feel like Bond. To my delight, that never occurs. Instead, the grittiness serves the character and story, and these elements allow the flick to pack a greater emotional punch than usual. We really do find a more human Bond, and the feelings that develop serve the flick well. He’s an emotionally distant, impetuous hothead, and damned interesting to boot. Royale really does eschew many of the series’ staples. That means no “Q”, no memorable gadgets, and only a hint of the Bond theme. The movie uses the latter in a clever manner. I won’t discuss it since it could act as a spoiler, but though we get the theme, it doesn’t come across in the normal playful, triumphant way. And let the ladies rejoice: the eye candy that is Craig shows a lot of skin in Royale. Call me a pig if you must, but that’s the only change found here that I don’t like. Bond exposes himself all over the place but we hardly get a glance of any women in various levels of undress. That’s progress? The flick even calls back Ursula Andress’s iconic emergence from the sea in Dr. No but features a swimsuit-clad Bond instead! Though the story lacks the usual fantasy and sheen, Royale creates an involving and taut tale. At 144 minutes, this is the longest Bond ever made; it runs a couple of minutes longer than 1969’s On Her Majesty’s Secret Service. Despite that extended running time, the flick never feels slow or leaden. It moves briskly and keeps us with it at all times. This seems especially amazing given the static nature of the movie’s second act. Much of that segment sticks us at the poker table. Sure, the story spices things up with an action sequence or two to give us a break in the card games, but the tale remains pretty focused on folks as they sit around a table. Despite that potential handicap, Royale stays compelling. I know that when I saw it theatrically I never felt bored or distracted, and neither problem developed during my second screening on DVD. Indeed, I found myself almost shocked at how quickly the film flew by me. Whenever I’d peek at my player, I’d feel surprised at how much of the movie had passed. This is a quick 144 minutes. From top to bottom, I find a lot to like in Casino Royale and very little to criticize. It’s easily the best Bond flick in years and it accomplishes the daunting cast of reworking the series. I can’t wait to see where Bond goes next. 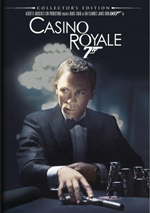 Casino Royale appears in an aspect ratio of approximately 2.40:1 on this single-sided, double-layered DVD; the image has been enhanced for 16X9 televisions. The flick offered a consistently terrific transfer. Sharpness always seemed strong. Only a sliver of softness ever appeared through the film. At virtually all times, the flick looked detailed and well-defined. I noticed no issues with jagged edges or shimmering, and only a little light edge enhancement could be seen. Source flaws were absent. In keeping with its gritty tone, Royale went with a fairly subdued palette. At times it showed richer tones, especially in the glamorous Casino Royale setting. However, colors usually looked a bit low-key and pale, which kept with the flick’s design. Blacks appeared dense and tight, while shadows seemed clear and smooth. Overall, the image was terrific. Matters worked just as well with the terrific Dolby Digital 5.1 soundtrack of Casino Royale. The movie offered a consistently vivid soundfield. Of course, the various action sequences brought the movie to life the best. I especially liked the dramatic scene at the Miami Airport, as various elements formed a dynamic setting. The rest of the movie also fleshed out the environment to a satisfying degree, and this was a good five-channel setting. Audio quality also seemed positive. Speech came across as natural and crisp, with no edginess or other issues. Music appeared vivid and dynamic, and effects fell into the same category. Those elements sounded accurate and full, and I noticed no distortion or other problems. The audio worked very well for the movie. How did the picture and audio of this “Collector’s Edition” compare with those of the original 2007 DVD? I thought both offered identical sound, but the CE presented slightly superior visuals. I believe that both discs came from the same source transfer, but I got the impression that the CE offered somewhat superior encoding. The prior disc showed a little artifacting and mild softness that didn’t appear here. Note that the improvements were mild, so don’t expect a night and day difference; the new disc looked maybe five percent better. Nonetheless, I did think the 2008 CE was just a tad tighter and clearer. This 2008 “Collector’s Edition” includes all the supplements from the 2007 release along with plenty of new materials. All of the duplicated materials appear on DVD Two; the contents of DVDs One and Three are exclusive to this set. On DVD One, we find two separate audio commentaries. The first comes from director Martin Campbell and producer Michael G. Wilson, both of whom sit together for this running, screen-specific chat. They discuss set design and locations, the title sequence, cast and performances, camerawork, cinematic influences, script and story, music, action and stunts, and a few other production issues. Despite a few minor lulls, Wilson and Campbell usually provide a solid track. They gave us an enthusiastic and engaging affair that covers a nice array of subjects. Both men offered a commentary together for GoldenEye that I really liked, and this one follows up on that effort well. Billed as a “crew commentary”, the second track includes producer Barbara Broccoli, production designer Peter Lamont, special effects supervisor Chris Corbould, costume designer Lindy Hemming, cinematographer Phil Méheux, screenwriters Paul Haggis, Robert Wade and Neal Purvis, casting director Debbie McWilliams, editor Stuart Baird, composer David Arnold, executive producers Anthony Waye and Callum McDougall, 2nd unit director Alexander Witt, stunt coordinator Gary Powell, assistant producer David G. Wilson and Eon Productions VP of Marketing Anne Bennett. The chat looks at visual design and cinematography, score and title song, set design and locations, various effects, stunts and action, script and story, reinventing the Bond franchise, costumes and editing, the film’s marketing, and some other notes. Some may not like the edited/compiled format, but honestly, no other method would work with so many participants; even if you packed all 17 people into one room, the result would be chaotic. As it stands, the track flows well and provides a wealth of great Royale knowledge. All the participants throw in some good info, though I especially like Hemming's thoughts about the various costumes. Overall, this turns into a strong piece. DVD One opens with ads for Hancock, 21, Vantage Point and Blu-Ray Disc. These also show up in the disc’s Previews area. No trailer for Casino Royale appears in the set. Over on DVD Two, we get all of the same extras that appeared in the original release. Becoming Bond runs 26 minutes, 15 seconds as it mixes movie clips, archival elements, and interviews. We hear from Campbell, Broccoli, Michael G. Wilson, McWilliams, screenwriters Purvis, Wade, Paul Haggis, Powell, stunt double Ben Cooke, and actors Daniel Craig, Caterino Murino, Jeffrey Wright, Eva Green, Judi Dench, Sebastien Foucan, and Mads Mikkelsen. The program looks at the novel’s path to the screen and its adaptation, finding a new Bond and how Craig landed the part, shooting in Prague and the Bahamas, Craig’s training, characters and performances, reactions to Craig’s casting, stunts and effects, and filming specific sequences. While the title of the show implies a focus on Craig’s performance, “Becoming” really acts as a general “making of” piece. The program does give us a few glimpses of the Craig-specific side but those don’t dominate. Instead, it goes into various production components. Though not as comprehensive as I’d like – and presented in a somewhat scattershot manner – “Becoming” provides a decent overview. James Bond: For Real fills 23 minutes and 31 seconds. It features Craig, Powell, Wilson, Foucan, Cooke, Green, Corbould, Witt, art director Peter Francis, freerunners John Kirr and Curtis Small, stunt driver Adam Kirley, second unit special effects floor supervisor Ian Lowe, and second unit assistant director Terry Madden. “Real” examines the movie’s various stunt sequences. We learn of location choices and the nuts and bolts of many difficult scenes. The show goes into the elements with appropriate detail and allows us to get a good look at this side of the production. Fun fact you won’t learn from this DVD: Foucan performed as part of Madonna’s troupe during her 2006 Confessions Tour. Next comes the 48-minute, 54-second Bond Girls Are Forever. A 2006 TV special hosted by Maryam d’Abo, it includes notes from Dench, Green, Murino and actors Halle Berry, Jill St. John, Ursula Andress, Luciana Paluzzi, Honor Blackman, Jane Seymour, Maud Adams, Lois Childs, Carey Lowell, Michelle Yeoh, Samantha Bond, and Rosamund Pike. All of the actors reflect on their Bond experiences and the general legacies of the series. “Forever” spans the realm of promotional fluff and interesting retrospective, but it usually stays in the latter vein. The frequent use of movie clips mean that the show clearly wants to promote the franchise, but the actors take on questions we don’t normally see addressed in this kind of piece. I especially like the chat between d’Abo and Lowell about working with Timothy Dalton. The program turns into a reasonably intriguing and enjoyable documentary. We also find a music video. Created for Chris Cornell’s theme song “You Know My Name”, it presents a mix of movie clips and shots of a lip-synching Cornell. We also get a minor spy story that involves Cornell, but it doesn’t take much of the piece’s time. The song’s decent, but this is a forgettable video. DVD Three presents more exclusives. Four Deleted Scenes run a total of seven minutes, 43 seconds. These include “Rescue and Recovery” (2:38), “Squandering Government Funds” (0:37), “Cricket Pavilion” (2:52) and “Gettler Raises Bond’s Suspicions” (1:14). If you expect anything memorable here, forget it. The clips really just pad out existing scenes in a minor way. They don’t add much. Seven featurettes follow. 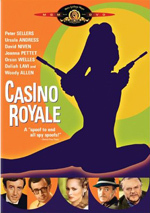 The Road to Casino Royale goes for 26 minutes, 33 seconds and includes notes from Michael G. Wilson, Broccoli, Wade, Purvis, Haggis, Campbell, USC School of Cinematic Arts Professor Rick Jewell, James Bond: The Legacy co-author John Cork, film and television professor Jonathan Kuntz, screenwriter Lorenzo Semple, Jr., Easy Riders and Raging Bulls author Peter Biskind, former radio promotion directors Mel Phillips and Harvey Mednick, and 1950s Bond girl actor Linda Christian. “Road” looks at the source novel, its earlier adaptations, and its laborious path to the screen in 2006. Usually background material of the sort examined in “Road” would be zipped through in about three minutes during a broader Royale documentary. The fact “Road” gets almost half an hour to dig into adaptation issues makes it much more enjoyable. “Road” gives us a terrific look at the winding path the source followed, and it proves quite valuable. For the 21-minute and 14-second Ian Fleming’s Incredible Creation, we hear from Broccoli, Michael G. Wilson, Haggis, Campbell, Wade, Purvis, Cork, The Life of Ian Fleming author John Pearson, Ian Fleming’s foreign sales agent Peter Janson-Smith, Ian Fleming: The Man Behind James Bond author Andrew Lycett, CIA Museum founding curator Linda McCarthy, Fleming friend “Oatsie” Leiter Charles, The Cambridge Spies author Verne Newton, former CIA Inspector General Frederick Hitz, and authors Barry Eisler, Ken Follett and Jeffrey Deaver. “Creation” discusses author Fleming and the origins of both Bond and the novel Casino Royale. Like “Road”, “Creation” delves into its subject well. We get a good feel for Fleming as well as the elements that influenced Bond. Expect another fine program here. Next comes James Bond in the Bahamas. In this 24-minute and 14-second piece, we find comments from Michael G. Wilson, McDougal, Purvis, Wade, Waye, Campbell, Lamont, Broccoli, Witt, Cork, Kerzner International Resorts VP Special Events Michelle Wiltshire, Bahama Film Commission’s Craig A. Woods, hotelier Jerry Inzerillo, Royal Bahamas Defense Force’s Lt. Stephen Rolle, filmmaker Gavin McKinney, stunt double Michelle Cove, diver Stuart Cove, relatives of developer Huntington Hartford Columbus, Sibilla and Carletto O’Donnell, Thunderball director of underwater engineering Jordan Klein, Thunderball/You Only Live Twice underwater crew Tony Hill, Buena Vista Restaurant owner Stan Bocus, and Albany House’s Jason Callender. Based on its title, I figured “Bahamas” would focus on the parts of Royale shot in that location. While it does look at some of that material, it also shows us all of the other Bahamian spots used in the Bond series over the decades. That gives it a nice historical perspective and makes it more interesting than the standard “on location” piece. Ian Fleming: The Secret Road to Paradise fills 24 minutes, 26 seconds with comments from Inzerillo, McDougall, Broccoli, Cork, Klein, McKinney, Lamont, Lycett, Pearson, Charles, Hill, Wiltshire, McWilliams, Director General of Heritage for the Bahamas Dr. Gail Saunders, Huntington Hartford’s daughter Juliet, Fleming friend Ivar Bryce’s stepdaughter Nuala Pell, and cousin Janet Milford Haven, Bryce friend Patricia Neal, and actor Diane Hartford. “Paradise” bears a definite resemblance to “Bahamas”, as it follows some similar topics. However, it delves more heavily into Fleming’s associates and shows us how they influenced the Bond series. This becomes another solid show. During the 23-minute and 18-second Death In Venice, we discover observations from Craig, Green, Michael G. Wilson, Wade, Purvis, Waye, Campbell, Corbould, Lamont, Powell, art director (Venice) Peter Francis, miniatures unit art director supervisor James Hambidge, and miniature supervisor Steve Begg. After the last two programs, “Death” gives us a more traditional behind the scenes featurette. It takes us to the Italian locations and also shows us effects created to complement the sequence. This show isn’t as insightful as its two predecessors, but it delivers the goods in the way it details the film’s climactic sequence. After this we locate The Art of the Freerun. The 13-minute and 38-second piece features Powell, Campbell, Meheux, Witt, and Foucan. We learn a bit about freerunning as well as the chase scene in which it’s used. Though “Art” seems fluffier than most of the disc’s other programs, it still manages to give us a reasonable amount of information. Finally, Catching a Plane: From Storyboard to Screen occupies 13 minutes, 47 seconds with notes from Campbell, Meheux, Powell, Lamont, Corbould, Witt, and McDougall. We follow the development of the plane destruction scene from its origins as a storyboard to its actual shooting. This means the piece acts as a storyboard-to-film comparison at times but it allows delivers more than that. It shows us the way this kind of sequence evolves in a satisfying manner. Next we get a Storyboard Sequence for “Freerun Chase”. This can be watched as storyboards only (10:56) or as a storyboard-to-film comparison (10:14). Either method gives you a good way to examine the original planning for this scene. DVD Three ends with six Filmmaker Profiles. Taken together, they run a total of 53 minutes and two seconds. These cover “Director Martin Campbell” (10:46), “Special Effects Supervisor Chris Corbould” (8:22), “Director of Photography Phil Méheux” (8:05), “Stunt Coordinator Gary Powell” (8:34), “Second Unit Director Alexander Witt” (7:04) and “Composer David Arnold” (10:13). Each one presents notes solely from the filmmaker in question, so don’t expect comments from others along the way. They discuss how they got into movies as well as aspects of working on Casino Royale and other Bond films. The men provide interesting perspectives on the series and their jobs, so we get quite a lot of useful insights. In addition to these disc-based materials, the package includes a 24-page booklet. It mixes movie photos and production notes. Nothing terribly revealing appears here, but the booklet acts as a nice complement to the rest of the set. The Bond franchise takes a darker path with 2006’s Casino Royale. It commits to a harsher reality and turns into one of the series’ most satisfying entries. The DVD presents excellent picture and audio along with a terrific and extensive roster of supplements. This becomes a very strong release of a fine movie. If you don’t own the prior Casino Royale DVD, you should definitely pick up this Ultimate Collector’s Edition. It really lives up to its name, as it packs in tons of extras. Does it deserve a double-dip for fans who already possess the original DVD? That’s a tougher call. Those who enjoy supplements will definitely want it, but those less interested in bonus materials should probably pass. I think the UCE offers a marginal improvement in picture quality, but if you don’t care about extras, it’s hard to justify the additional expense.